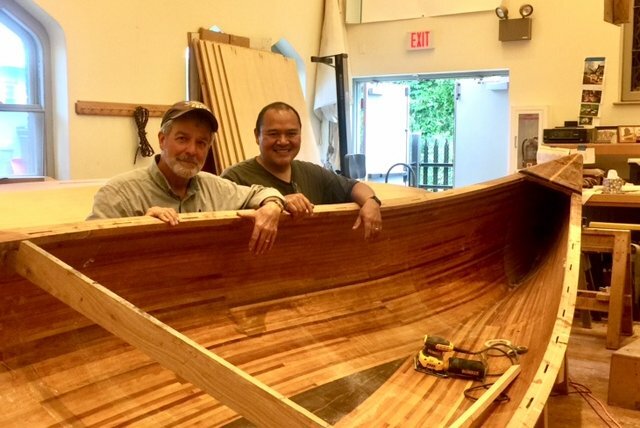 Jim Cummings and Tom Calisterio are helping 120 students launch wooden boats hand-built in Camden this Saturday as part of the BoatWorks program. In a city bounded by a mighty river, there is another waterfront. But the Cooper River is in some ways more the heart of Camden than the broad Delaware. The Cooper is an unseen and ignored artery pumping through the heart of the city, connecting urban Camden to 16 neighboring South Jersey suburbs. So it is fitting that on Saturday at 9:30 a.m., student boatwrights from Camden will meet upstream on the Cooper in Collingswood. The 120 Camden students who’ve spent the past year at the wooden boatbuilding program known as BoatWorks will launch watercraft they’ve built by hand. In some small ways, they’ll also be setting sail at the Cooper River Yacht Club, 450 S. Park Drive, Collingswood, charting a new course in their young lives. The students – from 6th to 12th grades – are set to paddle wooden strip boats that have gone from plans and unfinished lumber to tangible things of beauty, combining grace and utility. One of the vessels will be the 41st constructed since 2009. That’s when canoes christened Promise, Faith and Grace slipped onto the water, launching Urban BoatWorks, recalled Jim Cummings, the program’s experiential learning leader. The boat-building program is an offshoot of UrbanTrekkers, founded in 2004, which is also an offshoot of a summer missionary program begun in Camden 26 years ago and now known as UrbanPromise. Tom Calisterio, a former respiratory therapist, directs the boat program, aided by 16 male volunteers and one woman. "There's a lot for kids to learn," by doing, he said. Jim Cummings and Andy Field ready a wood-strip canoe for launching Saturday in Collingswood on the dammed portion of Cooper River. Camden students built the vessels. 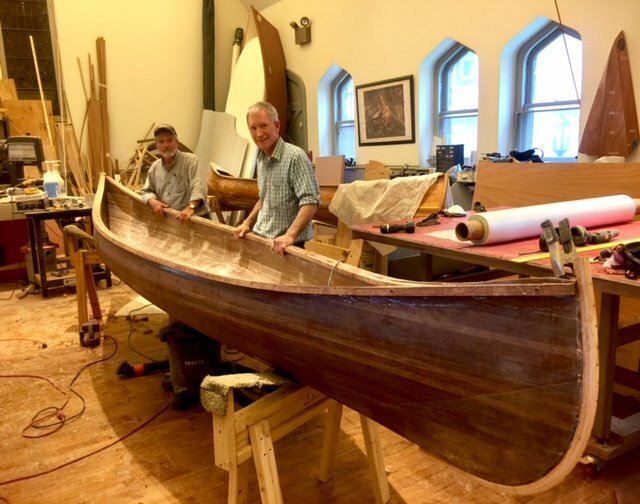 Building on their experience, BoatWorks is making several more challenging vessels this year, including a massive voyager canoe modeled on a French-Canadian trappers' vessel and a 30-foot dragon boat trainer. The boat shop is at Camden Shipyard & Maritime Museum, 1910 S. Broadway. The launch is open to all and the program is always looking for new volunteers and supporters, said Cummings. And if you’d like to experience the Cooper for yourself, you can sign up to see the river from the seat of a canoe by clicking here.